Trip To Ranu Kumbolo Lake (Climb And Camp). Ranu kumbolo is highest lake in java (2400 masl) located in bromo tengger semeru national park. The lake it self is a part of active volcano (mount semeru). According to geological analysis, ranu kumbolo formed by an the absence of magma in the magma chamber. When the magma chamber empty, remaining empty space and the materials above were collaped to fulfill the space cause of gravity. To go there you have to hike for about 4-5 hours from Ranupani village (starting point). it’s a beautiful lake sorrounded with massive field for camping ground. the morning fog is so serene & beautiful, take a half hour walk around the hill & you will arrive in lavender field. Ranu Kumbolo Lake is a freshwater at the foot of Mount Semeru has an area of about 15 hectares. Ranu Kumbolo Lake is familiar for those who will climb to mount semeru summit which is the highest active mountain peak on the island of Java. Ranu kumbolo is located in Area Bromo Tengger Semeru National Park at height of 2400 Mdpl.Your could reach there by hiking about 4-5 hours. it’s really exhausting but the views is beautiful. Through Ranu Pani and first checkpoint then climb and camp at ranukumbolo lake is magnificent view, temperature can be below zero so prepare your self well with enough gooud, good sleeping bag, thick jacket, pants and socks. Even in the coldest night you’ll find ice flakes on your tent or the things you leave outside. Meeting point pick-up in Surabaya / Malang in the morning. then headed Ranupane gate ascent to Ranu Kumbolo Lake and Mount Semeru Summit. After arriving in Ranupane, take care of permits and check luggage and then starts climbing towards Ranu Kumbolo. Ascent will be pursued for approximately 4-5 hours of trekking. On arrival at Ranu Kumbolo pairs of tents and overnight. Mornings can be used to see the sunrise at Ranu Kumbolo. After breakfast, we will head climbs love and grassland (lavender field). Back to ranupane village and then travel back to the city of Malang / Surabaya, and the trip ended. 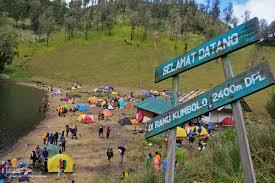 Ranu kumbolo is highest lake in java (2400 masl) Trip climb and camping at ranu kumbolo. The lake a part of active volcano (mount semeru mahameru).Ranu Kumbolo Lake is familiar for those who will climb to mount semeru summit. Surabaya Bromo Tour Package Ijen Crater Banyuwangi Bali Copyright © 2019.